Face-to-face interaction in it’s most basic form has certain elements which are always present: more than one person, each with at least three distinct viewpoints. 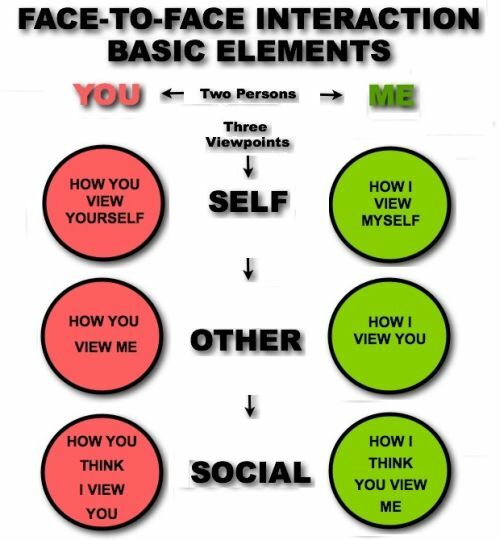 These elements comprise the dynamics of face-to-face interaction. Dyadic interactions are focused on here to illustrate the multiplicity of persons and viewpoints. Assumptions are always present and, as considered here, involve a comparison between viewpoints. For example, whenever I view you, I make an implicit comparison with how I view myself. This is an assumption of similarity or dissimilarity. When I consider how I think you view me, I am making an implicit assumption of familiarity when that viewpoint is compared to how I actually view you. The assumption of familiarity-unfamiliarity arises from this comparison. An assumption of congruence-incongruence arises from a comparison between how I think you view me and how I view myself.